Stunning holiday resort with lovely holiday houses, authentic cottages, rooms, campsite, swimming pool and restaurant. This great village stretches over 6 hectares and comes with holiday houses, cottages, rooms, . . . Elegant chateau on the border of the Correze and Dordogne, enjoying privacy, tranquillity and panoramic views of the surrounding countryside. This imposing Renaissance style Chateau dating back to 1895, has been carefully restored . . . Magnificent large 18th century Chateau, fully renovated with on-going gite business and over 15acres of parkland & offers considered! 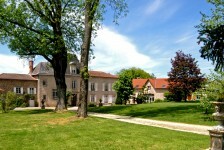 Fully renovated residential and sumptiously decorated chateau with 1200m² of living space set . . . This 18th century manor house and gites complex has been renovated to a high standard. It . . . This beautiful Chateau will give you all you could possibly want and more. As well as the . . .